Every website or blog can be used to generate a passive income. There are many ways to monetize a website. However, you would agree that no one likes the idea of cluttering one’s site with an array of advertisements from a range of different ad networks. So it becomes logical to simply choose the best one. AdSense is probably the most popular service for this. It can be used to display text, video or image advertisements. As a website owner, you will be paid each time your visitors click on ads. So what is Google AdSense? One of the best ways to make money online! Let’s delve deeper into this before learning to add AdSense to WordPress. If the account gets approved by Google, contextual ads will start appearing in various locations of the website. Your website would be automatically crawled by Google’s spiders in order to know more about your website’s pages. This helps Google bots in putting the best-fitting ads on your website. For example, if you love to blog about shoes, Google bots will take that as a clue and will put ads related to socks and footwear on your website. They do so by automatically checking their ads database and finding the most related ads on the basis of your WordPress website. It is obvious that a person who is reading about shoes is more likely to buy footwear than someone who is researching info about cyber security. Makes sense? Being a logical, honest and reliable method to monetize your WordPress blog is not the only reason why we recommend using Google AdSense, as it has many more advantages. Let’s have a quick look at each of them, before proceeding with adding AdSense to WordPress. Easy to add multiple blogsYou can use it with mulitple websites. The only requirement is that your blogs should be in line with AdSense terms and policies. This is far better than most other ad networks where you need to add all your websites manually. Seamless support on the goNeedless to say, when you are dealing with AdSense, you are actually working with one of the top companies – Google. Rest assured, you can clear all your queries and doubts by accessing related customer forums. AdSense is very easy to get started with, even for beginners. There are tons of video and text tutorials, even websites that can help you become a pro in this field. Prompt paymentWhen you activate AdSense advertisement program on your website, you no longer need to worry about the payment. Many CPC companies are fraudulent and non-transparent in terms of payment, which is definitely not the case with AdSense where you’re paid on time, always. An easy way to make moneyA WordPress blog that you may have started as a hobby can also make you money with very little effort by simply placing some ads on it. What could be a better reason to opt for AdSense than this? The manual method of adding AdSense to your WordPress website seems too tough for you? Well, fret not! Here are a few plugins which would help you in this purpose. First of all, you need to sign up for Google Adsense account. It can be done here. The sign up process is easy and will take only a few minutes. However, it can take up to 3 days for Google to check and approve your application. Access the Adsense dashboard and press the My Ads button, which is located in the top menu. Hit the New ad unit button. Name – The name of your ad. Enter a unique name here – it will be easier to manage multiple ads in the future. Ad size – It’s a very important setting, because ad sizes make a great impact on the view of your website. It’s recommended to select Responsive if your website is adapted to all devices. Select and copy the code – you will need it in the next step. 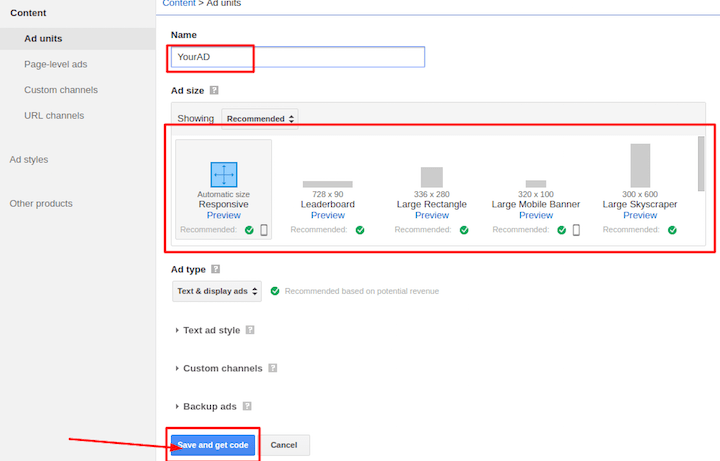 If you need a more detailed guide on how to create an ad, see the official Adsense Help page. Google AdSense, also known as Google Publisher plugin, is an official AdSense plugin written and managed by Google. This plugin helps you to easily add AdSense to your WordPress website due to its easy-to-use interface. Ad Injection is another great plugin through which you can integrate AdSense with your WordPress blog or website on the go. This plugin is not just limited to AdSense but can also help you with integrating ads from other networks too. Not only that, AdSense allows you to control the visibility of ads – you can adjust them by your posts length or age and IP address of the visitor. Ad Inserter is a powerful plugin that would help you with inserting AdSense ads on your WordPress website. At times, might refuse Google AdSense responsive ads. 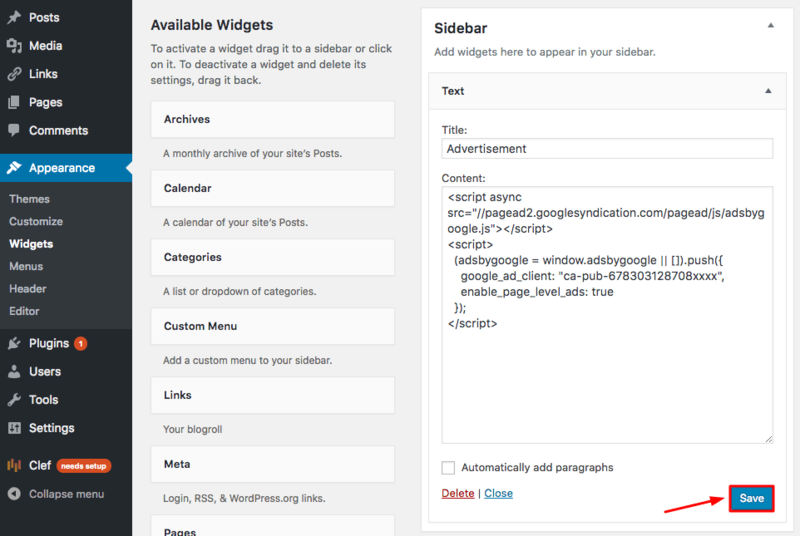 Log in to your WordPress dashboard, navigate to Appearance -> Widgets section. To add a new widget, select Text and drag and drop it to the place where you want to display the ads. In this example, we decided to put Adsense to Sidebar, but you can choose any part of your website. Press the Add Widget button. Fill the Title and Content fields. Title – Enter the name of your widget (you can leave it empty). Content – Paste the copied code from Google Adsense website. Once you are done press the Save button. So, all set? Here are a few best practices that could help you in getting more clicks on ads, thus helping you in earning better. Research well before getting startedIt is highly recommended to follow AdSense rules in order to get your AdSense account approved quickly. Further, it is also suggested to select a high paying niche for your blog, which means selecting a niche that is often researched by people on Google. Proper ad placementThe position of the ad on your web page determines your revenue to a great extent. You should place ads on the top of the page, using both images and text ads. If placing an ad on a page with a lot of content, you might like to include an ad between the texts too. Choose the right AdSense sizesIf your main aim is to earn via AdSense, it is highly recommended to choose the size of ads carefully. Some of the sizes that work best include 336×280, 728×90, and 160×600. Track category performanceMake the best use of category blocking feature of AdSense and avoid placing ads that belong to the categories that do not yield better earnings. Make the best use of AdSense heatmaps in order to better understand the psychology of your visitors and design your website accordingly. This will help you get more clicks, and thereby more income. Write good and engaging content that would attract users to your website and would thus increase the chances of getting clicks on your ads. Conduct Google experiments to split-test: what is working for your website and what is not. Make sure that both your website and the ads are responsive. Keep yourself up-to-date with their latest policies. Contrast and design your ad styles in accordance with your website theme. Don’t overuse AdSense and don’t clutter your website with too many ads as this will bounce off the visitors, thus minimizing your earnings. Don’t click on your AdSense ads even by mistake and don’t ask your family members or friends to click on them for you. Fraudulent clicks will get your account banned. Avoid making use of texts like ‘Click on ads’. Such texts are considered as forcing users to click on your ads and is against Google AdSense policies. Don’t place ads on empty pages. Avoid bringing automated traffic to your website at all costs. Don’t make multiple AdSense accounts with the same payee name. This simple tutorial intended to show how you can add Adsense to WordPress and monetize your website. Now it all depends on you – publish quality content and advertise your website in order to start earning money from Adsense ads. However, care should be taken that your cent per cent is in accordance with their guidelines as there are some areas for which AdSense has zero tolerance and might block your account immediately. Rest assured, Google AdSense is easy to integrate with your website and you can do it either way- manually or with the help of a plugin. Keep in mind the above-mentioned pointers and keep making money online. If you are out of ideas how to drive traffic to your website, check this tutorial. Thank you, this helped alot. I don’t know what that means – are able to cover this in your post. It would be good for nubes. You need to edit your website files and paste the code. You can do this with File Manager or using FTP client and your default text editor. If your website is built on WordPress, then you can simply use one of the WordPress plugins. I’ve designed my website What I just need now is domain and host. What do I need to get my files into wordpress website. Seems we can not more do Adsense on Free version of WordPress? Can you please confirm this? Are you referring to a free WordPress hostinger on wordpress.com? I was not able to apply for adsense as i didn’t know how to do that. But this articles really made me understand it properly.